I've only got a few more days until the craft show at work, which means I only have a few more days to crank out as many work-friendly figurines as I can. I also need to make an order form so people at work can place orders for the figurines; if they're able to just buy them outright, the best ones will sell early on, leaving a bunch of mundane figurines for the rest of the day. By having an order form, people can make a request for an existing figurine, pay me up front, and have me deliver them later. That'll also give me an idea of the kind of figurines that sell the most quickly for future shows. 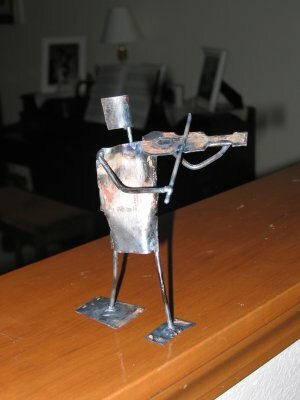 I play the violin, so I'm not sure why I didn't think to make this figurine earlier. It seems like a no-brainer.